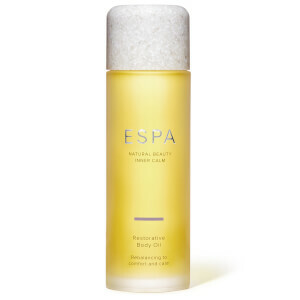 This warming body oil is best used before or after exercise. After your bath or shower, massage into skin in firm, upward movements towards the heart until fully absorbed. To intensify results, use after Fitness Bath Oil. Glycine Soja (Soybean) Oil, Cocos Nucifera (Coconut) Oil, Prunus Amygdalus Dulcis (Sweet Almond) Oil, Persea Gratissima (Avocado) Oil, Helianthus Annuus (Sunflower) Seed Oil, Rosmarinus Officinalis (Rosemary) Leaf Oil, Litsea Cubeba Fruit Oil, Citral, Lavandula Angustifolia (Lavender) Oil, Pimenta Acris (Bay) Leaf Oil, Eugenol, Linalool, Eucalyptus Globulus Leaf Oil, Tocopheryl Acetate, Mentha Piperita (Peppermint) Oil, Limonene, Eugenia Caryophyllus (Clove) Bud Oil, Geraniol, Pelargonium Graveolens Flower Oil, Beta-Carotene, Daucus Carota Sativa (Carrot) Root Extract, Daucus Carota Sativa (Carrot) Seed Oil, Ascorbyl Palmitate.